CYCLING: NOT being able to hear hasn’t put young Solihull cyclist William Ryan off his two pedals. Ryan, who lives in Coventry, races for Solihull Cycling Club’s Under 14s category and has had to overcome significant challenges to reach the level he is at. 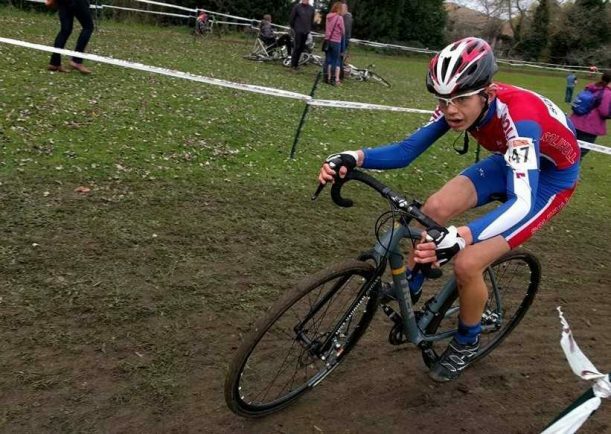 The 13-year-old has finished in the top five riders in three of the opening five rounds of the West Midlands Cyclocross Series. His form was so good, the youngster even competed at the opening round of the National Trophy Cyclocross Series in Derby on Sunday, where he rode against the best Under 14s riders in the country. Though the competition was stiff, William finished a remarkable 25th from a field of 65 in his first ever national race. Proud father Gez said: “William always enjoyed messing about on a mountain bike but we didn’t know he had competitive potential until his school took him to the Banjo Cycles Summer Cyclocross in 2013. Since joining Solihull Cycling Club, the whizz kid has proved a hit on track and learns his craft by observing other riders and lip-reading his coach’s comments. Asked about future ambitions, Ryan said he wants to compete in the biggest race of them all – the Tour de France. He said: “I love racing my bikes. “I enjoy cyclocross, track and closed circuit racing.